Description: Puget Sound and Pacific 1004 is obviously no longer working in revenue service. This locomotive was rebuilt a few years later and returned to service by 2004. Description: RailAmerica 2482 sits in the Puget Sound and Pacific deadline at Elma, WA before it was shipped out for rebuilding. I caught it on a UP train in Tacoma later in 2001. Description: These fresh rebuilds were tucked in the bottom of Q684s train and made for a surprise. All ex SP units. Description: Unit on the DGNO. Description: Purchased from SP and given a heavy rebuilding, 2482 is seen here parked in DGNO's Mercer Yard. Description: Two leasers and a company owned diesel idle in Mercer Yard, Carrollton. Description: Saturday morning at DGNO's Mercer Yard finds five four axle EMDs shut down for the weekend. These units will be here until early Monday morning when the work week begins. Description: Rail America corporate colors isn't enough to hide this SW1500's Espee roots. Description: Although the SP light package was removed a long time ago the larger SP numberboards remain. 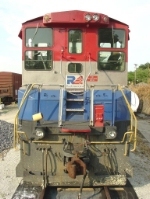 Description: Recently sold to The Anderson (AEX), DGNO crews have painted out all the RailAmerica lettering on the hood and number under the cab.